Have you ever wondered what it is exactly about chocolate that has such an irresistible attraction on most of us? I personally can never get enough of it. Most of the time I eat healthy, but I love me a good piece of chocolate. Whether it’s a chocolate bar, chocolate ice-cream, cake or some sort of chocolate drink, I truly enjoy it. Chocolate by itself is actually really healthy, but because pure cacao has such a strong taste, it does need some sort of sweetener. 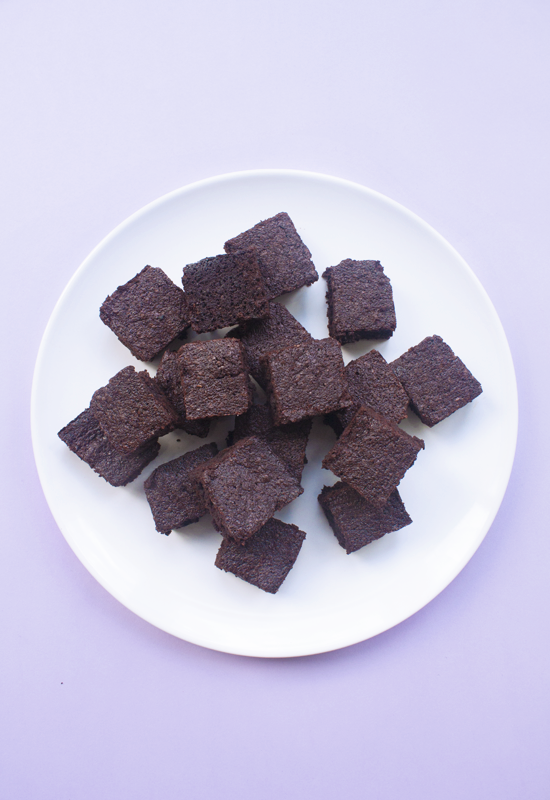 These vegan chocolate brownies with coconut sugar are a rich, fudgy treat with a very pure chocolate flavor. The recipe is inspired by Adam and Joanne’s brownies from The Inspired Taste. I adapted their recipe and replaced the butter and eggs with vegan alternatives. 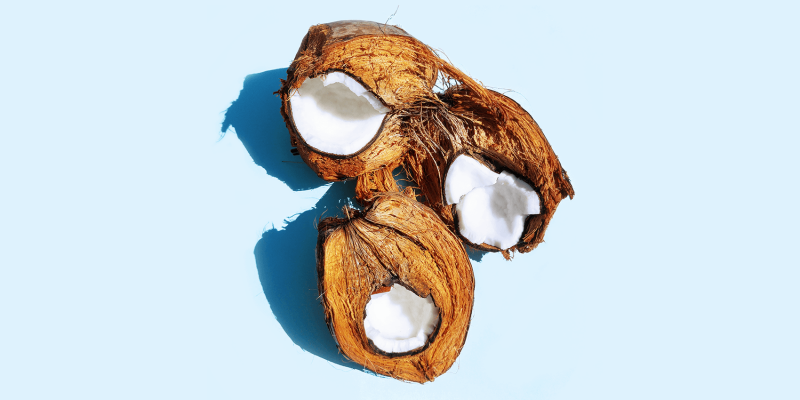 Coconut oil, which is wonderful for baking, is used instead of butter and Chia seeds and water egg mix instead of eggs. 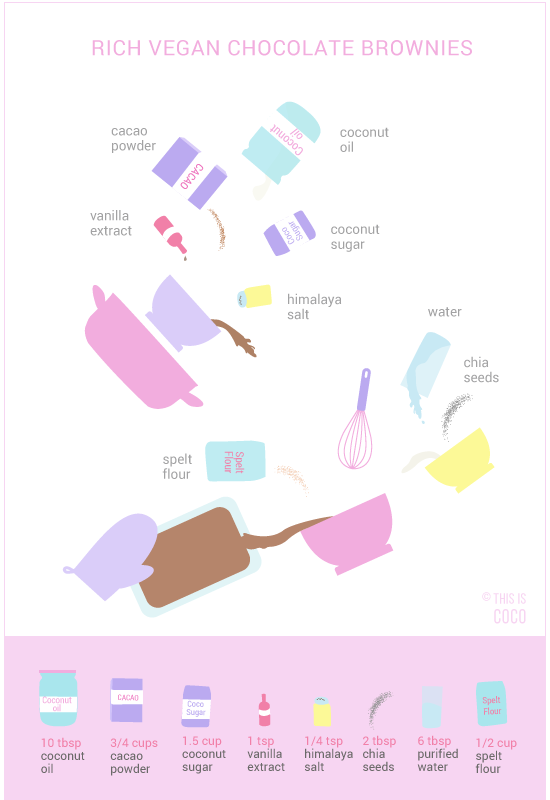 Yes, you can totally bake without eggs using these amazing seeds and I will show you how to do it! To make the brownies a bit healthier, I use coconut sugar; I avoid regular white sugar as much as I can. I replaced the all-purpose flour with spelt flour, which is a more nutritious option. Finally instead of using cocoa powder I use raw cacao, a purer, less refined chocolate powder. Serving tip: if you’re looking for a soothing warm drink to accompany your vegan chocolate brownies with coconut sugar, try this homemade masala chai recipe. Start by preparing the egg replacement. You can use ground chia seeds or ground flax seeds. When the seeds are mixed with liquid, they form a sticky, goopy texture, similar to eggs, which is very suitable for baking. Grind the chia seeds and mix them with water in a bowl. Set aside in the fridge for 15 minutes. Put the coconut oil with the cacao powder and coconut sugar in a bowl and place it in a saucepan with shimmering water. Let it slowly melt over medium heat while stirring. Once the mixture is fully melted remove from heat. Preheat your oven to 325 F / 160 C.
Add the chia seed egg replacement and mix everything well. Add the spelt flour to the mixture and use a spatula to beat it for about 2 minutes to get it nice and airy. This is important, otherwise the fat might separate during baking. The batter should be thick and well mixed. Pour the batter in a baking pan greased with coconut oil. Bake for 20 minutes – you know it’s ready when you put a toothpick in its centre and it comes out clean. The brownies should be firm, but moist. 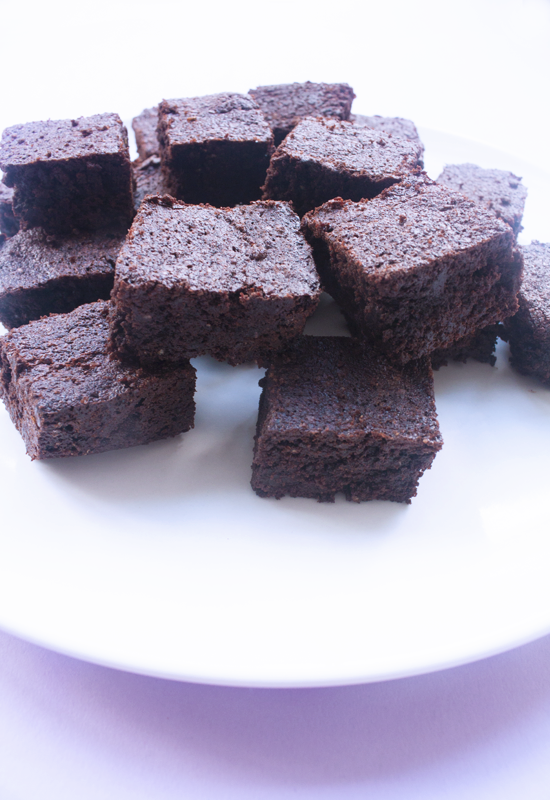 If you’ll be making these vegan chocolate brownies with coconut sugar let me know how they turned out! Share your picture on Instagram #coconutqueendom, I’d love to see!